Jumping over a motorcycle? Jumping over a 2 meter guy? 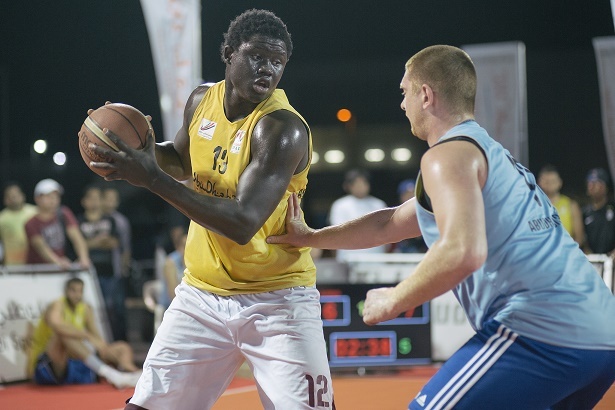 Nothing was impossible at the fourth stage of Abu Dhabi 3×3 Basketball Tour. Justin Darlington and Rafal Lipek, two of the best dunkers in the world, gave their best to an electrifying crowd. The slam-dunk contest was the highlight of the event and the two athletes put up an incredible performance. First, the Canadian, Justin Darlington, chose the tallest guy from the audience, over 2 meters height and just jumped over him. Then, Rafal Lipinski, the living proof that white men CAN jump, brought to the court a motorcycle and jumped over it. They battled for the slam-dunk champion crown and Rafal Lipinski was the best one in the end, taking home the trophy. Later in the evening, the stage was taken by the top players in the world. With the first five players in the FIBA 3×3 World Ranking taking part in the competition, the show was guaranteed. 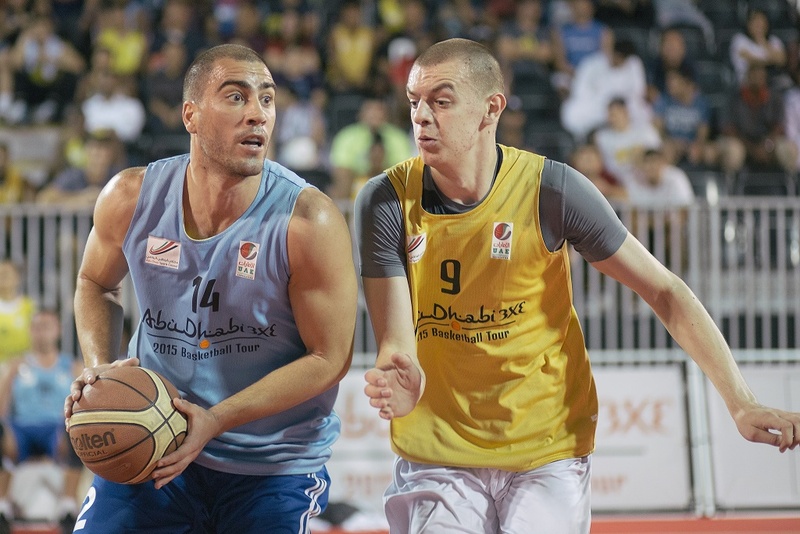 World number one Dejan Majstorovic and his team, now representing Abu Dhabi, won the final against Al Ain team, starring Angel Santana, the fifth player in the world and the local star Amer Al Sati, one of the best 3×3 basketball players from UAE. 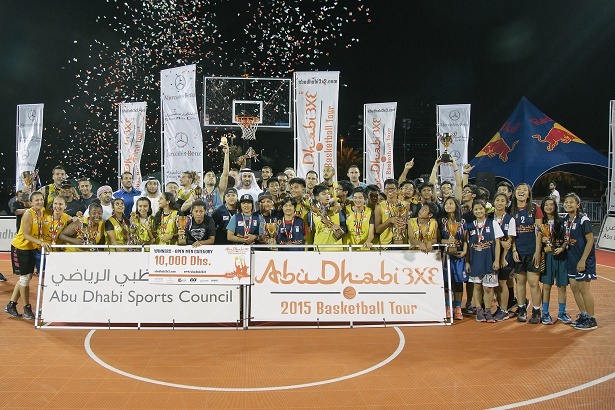 Led by Dusan Domovic Bulut, with his deadly crossover and his stunning three point shooting, the Abu Dhabi team won 21-9 and claimed the 10,000 dirhams money prize offered by the organizers. With one exception, in the groups, they won all their games before the 10 minutes time limit, by scoring 21 points and proving one more time that they are the best in the world in 3×3 basketball. Top teams from Dubai, Al Ain or Sharjah gathered for this true basketball fest, which was organized in the parking of Nation Towers by Abu Dhabi Sports Council, together with its partners, UAE Basketball Association, Extra International Sport and Sport Arena and with the support of Mercedes – Emirates Motor Company and Red Bull. Everybody enjoyed to be part of the event, from small kids playing in the inflatable basketball toys to the tough guys that were competing for the big prize. “We are trying to build a legacy and I am very happy that the competition is growing from one tournament to another”, said H.E. Khalid Al Hanaei, chairman of 3×3 basketball from the UAE Basketball Association. Also impressed were the members or the Doha Juniors team, actually the National Team for U18 of Qatar. Even if they played in the Open Category, the Qatar team advanced to quarter finals, only to be defeated by the champions, the Abu Dhabi Team. “For our young kids was a good experience and we would like to have as many tournaments like this as possible. The level of basketball was very good and it is exactly what we need for our young players” said Khalid Elmaghny, assistant manager of the Qatar National Teams. 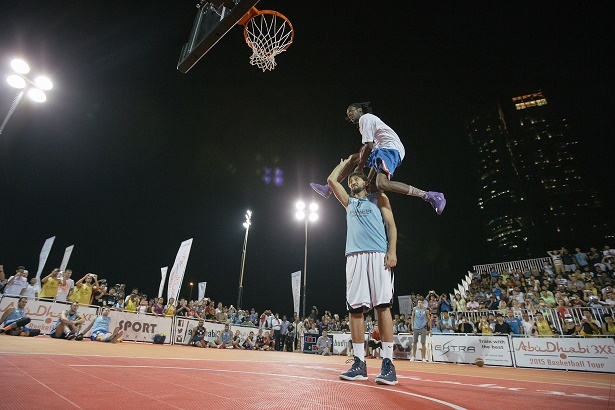 The Abu Dhabi 3×3 Basketball Tour will conclude on 7-8 May, on Corniche East Plaza with the Tour Final. The best teams from each of the regular stages will play the final tournament and also some wild-cards will be awarded for the greatest teams. The first part of this year’s 3×3 basketball season will end with the Abu Dhabi 3×3 Challenger, on 14-15 May, where top teams from UAE and GCC area will fight for a place in the FIBA 3×3 World Tour Master in Manila.